After the debacle of the offer for a Victorian on Juniper Ave, I took a step back and started thinking of a new approach. The idea of a Victorian in Wildwood is appealing, but the bulk of the town's old housing stock is more modest 1920s and 1930s cottages. In addition to the Doo Wop motels, these small, modest houses also get knocked down to put up obnoxious new plastic condos. I had seen a few of this smaller bungalows and Foursquares, and decided against them to pursue a Victorian. After failing on my last 2 Victorians, I kind of got soured on Wildwood and I started looking elsewhere just for fun. I ended up finding an amazing house up in Stroudsburg, PA. More on that in another post, but I realized that with the lower prices in Stroudsburg, I could buy a Victorian there and then have enough left over to try and buy a more modest house in Wildwood for cash. I convinced myself this approach seemed better because the thought of Wildwood and the rest of the Jersey Shore disappearing in a few decades has started to weigh on me. With sea levels rising and the fact that New Jersey's land is also sinking, I've been reading lots of reports of how the Jersey Shore barrier islands will be gone in a few decades. The idea of restoring a Victorian to watch it fall into the ocean when I'm in my 80s seems depressing. The other issue with buying a beat up house in Wildwood is securing a mortgage. If you are looking to get a fixer-upper, there could be enough issues to not be able to get a mortgage. Also, from some research, if the house is in bad shape, the insurance could be a lot higher which is required if you have a mortgage. There are ways around it if you use a Homestyle mortgage, but that requires more overhead because you need to get more inspections, line up contractors, and get work approved. I don't want to be rushed into any fixes because I want to make historically accurate repairs, not just slap on a new roof and vinyl siding to make the house livable. I started thinking of trying to buy a cheaper and beat up house for cash and not have to deal with insurance, mortgage, and certificate of occupancy issues. That way I could fix the house up on my own timeline without the Man breathing down my neck. 2nd floor bungalow bedroom with dormers and slanted roof. 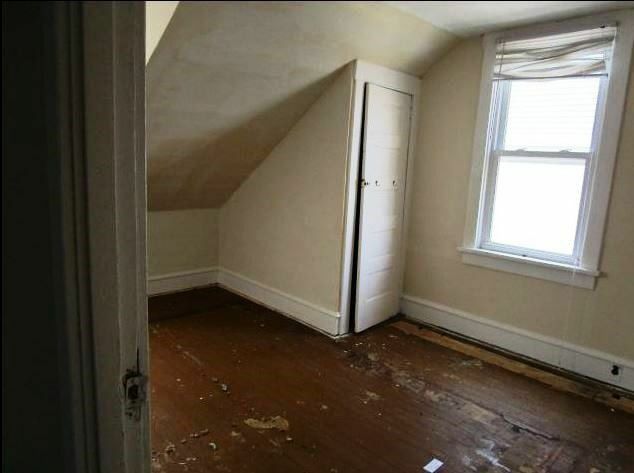 I started looking at houses in a lower range and found a beat up 1920s bungalow. I toured the house with my agent and it was in rough shape, but not trashed. When we first arrived for the viewing, it was a bit weird because the listing agent wasn't local to Wildwood. There was a lockbox, but also a padlock. Problem was no key for the padlock. We called the listing agent for advice, but were routed into a computer operator. While we were on hold, I saw a key on the ground and that ended up opening the padlock. Inside, the place looked like it had potential to be restored to a nice 1920s Arts and Crafts bungalow. The price was 150K which was a bit high, so I put the house on the back-burner. A week later, I started thinking of the Victorian up in the Poconos, but got an alert that they dropped the price on the Wildwood bungalow to 90K. I had the idea to try and grab both houses. Get a mortgage for the Victorian and then make a low cash offer for the bungalow. If I played it right, I could potentially get both for less the price of the Juniper Victorian. I called my agent to float a cash offer of 60K to the agent. Here's where things got weird. My realtor was unable to reach the agent for the house and kept getting an answering machine and no one would return her calls. As mentioned the agent wasn't local to the area, so they had no relationship with the Wildwood realtors. I started doing some digging on the listing agent. She was from a company called "REALHome Services and Solutions". Hmm, Real homes as opposed to the bad fake homes. They had a website but it was generic and was servicing many states, not just NJ. I googled the listing agent and no website which is weird in this era. I did get her Linkedin profile with title of "Entrepreneurial Professional Executive". I did some more digging on REALHome Services and found a contact in a temporary office in NJ and an email. I sent an email saying I wanted to put an offer in on the house, but we couldn't find anyone to talk to. I went to the site and sure enough saw the house listed. Problem is that the site is a real estate auction site for bank-owned properties. I started reading up on hubzu.com and it had a very vocal group of people who said it was a scam. A few people defended it, but I would say it was about 80% negative. The bungalow was listed as "Auction Ended", but the agent told me to make a bid on hubzu.com because the banks would review back-up bids even if the auction had ended. This sounded in line with the complaints I read where people complained the auctions would be restarted to get the highest bids. Since the site doesn't let you see any prices, I decided to register and try bidding 60K. After submitting the bid, it was rejected saying the minimum bid was 145K. Hmm, that's closer to the original asking price. But if you go to the MLS sites, the house is listed at 90K. Since that all seemed shady, I let my agent know to give up on that house and moved on to focus on the Stroudsburg Victorian.